Indeed, by relying on cycling as a primary mode of transport, one sends the message that s/he supports greener transport, refuses to spend thousands every year on a personal vehicle, and avoids contributing to congestion. It is this dedication to a more sustainable future that is bringing individuals together around cycling. In Brazilian cities, for example, biking culture is steadily growing, with an increasing amount of cyclists hitting the roads. 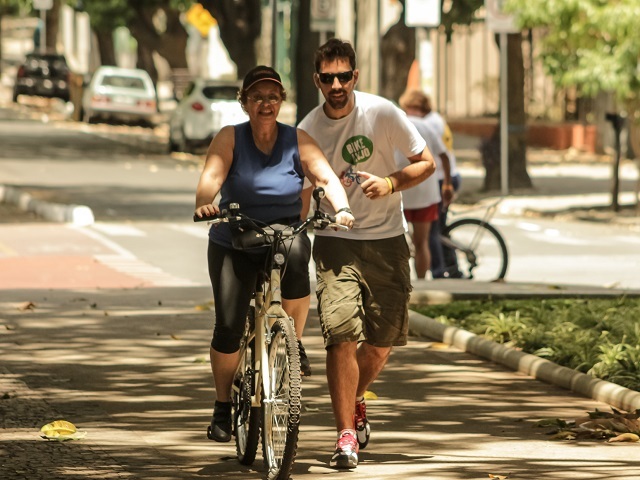 Below are a few initiatives that are successfully inspiring both current and future cyclists and fostering a strong bike culture in Brazilian cities. From 2010 to 2013, the initiative Cidade da Bicicleta (“Bike City”, in English) created a collective space in Porto Alegre for residents to discuss urban mobility and cycling activism. Over its three years, Bike City (BC) hosted lectures, film screenings, activist meetings, parties, and other activities, in addition to its community workshop. As a community space, the workshop provided expertise on bicycle maintenance, and helped individuals repair their bikes. Despite ending formal operations two years ago, BC has since been fighting for its revival. For months, cyclists of the community engaged in conversations and sent letters to city leaders demanding land for a permanent BC location. In response, the mayor of Porto Alegre, José Fortunatti, signed Decree No. 18682 on June 10, 2014, ceding an area of 674.50 m² for a new Community Workshop. The legislation was a watershed moment for the group, granting them the space they needed. With their first victory now behind them, BC faces an even tougher challenge: ensuring that their work has funding. Their goal is to raise around $30,000, which will allow them to immediately reopen the Community Workshop and implement the first phase of its activities. To raise the funds, the group is launching a financing campaign on Catarse, a Brazilian crowdfunding platform. With a large following of supporters and activists, BC is optimistic that it will be up and serving the local community soon. Meanwhile, however, BC lives on through the programs that it inspired and helped establish. One initiative created inside BC is Mobicidade (the Association for Urban Mobility on Bicycle), which supports public policies that encourage non-motorized modes of transport. One of the organization’s recent initiatives was the creation of the app “Can you go through?”, which maps intersections in Porto Alegre and assesses how safe they are for pedestrians. Residents can go online to individually rank crosswalks and provide suggestions for improvement. Many of us take for granted the ability to ride a bike. But for those living in large and congested cities who have never cycled, it is often difficult to start learning. Especially as residents grow older, some give up the desire to learn how to cycle altogether. But one organization is showing people that it’s never too late. A group called Bike Anjo (Bike Angel, in English) is spreading throughout Brazil and teaching individuals how to bike, which routes to take, and instructing residents on proper road safety. A volunteer network, the organization is composed of experienced cyclists who have dedicated themselves to teaching beginners. Born in 2010, Bike Angel has around 250 volunteers across Brazil, and has successfully financed its work through crowdfunding. To coordinate operations, the group has an online platform for facilitating communication between volunteers and residents. The collective also runs a more formal school program that periodically holds classes in Brazilian cities, typically on weekends. On its website, you can check the schedule of classes, request a Bike Angel in your city, or volunteer as an instructor. In addition to classes and volunteer programs, Bike Angel has launched a number of initiatives in Brazil, such as Bike to Work Day, urban mobility workshops, and training sessions. For more information on their operations, check out their YouTube channel.